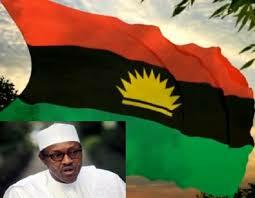 BIAFRA: BUHARI A VICTIM OF HIS VOW: "BIAFRA WILL COME OVER MY DEAD BODY"
The president of Nigeria, Muhammadu Buhari seem to have been a victim of his spoken words which he made in April 2016, that Biafra will only come over his dead body. The notion that "there is power in spoken words" seem to be playing out in the case of Buhari's Ill health as it has degenerated from ear impairment, to paralysis and cancer as the world have come to know. Just like the case of late President Umaru Yar’Adua who left Abuja for medical treatment to Saudi Arabia and returned months later on life support to die at home, the current dictator of Nigeria, Muhammadu is reported to be living on life support machine in an undisclosed hospital in London and is likely to return in a casket. Also, like Yar'Adua's situation which was shrouded in great secrecy and made open, Buhari's case will have no option than to be exposed as the masses are beginning to pressurize the government for information on his health status. The retired major Gen. Muhammadu Buhari who committed treason in the year 1983 when he intentionally and forcefully toppled the democratic government of Alhaji Shehu Shagari has fallen not like a hero but like ordinary vegetables to be trampled on. what a shame! Buhari's latest condition has proven Nnamdi Kanu, the leader of Indigenous People of Biafra (IPOB) not only right but a prophet when he stated, "Biafra is an ordained and a divine project from God almighty, whosoever that come against Biafra and Biafrans, the children of the most high God will be consumed. Just like Pharoah in the Bible was put to shame when he thinks all power is bestowed on him, Buhari's case worsened as he is not only a ghost of his former self but also blind, deaf and dumb. African Hitler Muhammadu Buhari got into power with the help of militias, herdsmen and Boko Haram killing squad. He believes and act in a tyrannical manner unconstrained by law. Buhari gained power shrewdly and maintained it through cruelty and violence. His administration has been rough since he climbed the mantle of leadership. Recall Buhari made lots of inciteful statements and vows which one of them is "I have no regrets whatsoever about the gruesome massacre of Biafrans carried out by myself and my goons in 1967- 1970" Buhari said, and I'll kill Biafrans and Biafra protesters again to keep Nigeria one". Buhari commenced the world largest ethnic cleansing of innocent and defenceless Biafrans just like he vowed to with this dates: October 2015, 9th of February 2016, 30th May 2016, 20th January 2017 etc. Again, Buhari being a man who is a victim of his words recently declared and vowed that over his dead body will he allow Biafra to emerge as a sovereign nation, neither would he tolerate Biafra agitation in his regime. Now Nemesis is hovering around his neck, he got what he bargained for. The bottom line is, Buhari is dying just like he willingly asserted, while Biafra restoration is nearer. Just like the undisputable leader of indigenous people of Biafra, Nnamdi Kanu who put his life on the line to restore Biafra, and without fear maintained his stance on the noble quest to restore Biafra by insisting that "it's either Biafra or death", despite being tortured and incarcerated and still not deterred, Buhari vowed that Biafra will never come while he is alive and that seem to have come to pass. It's a mockery to Nigerians, Buhari and the British that the terrorist hired to rule lawless damnable entity Nigeria couldn't stand the heat emanating from hard-core Biafrans. Buhari's dying wish has been granted to him accordingly. Biafra is fast approaching, Buhari is dying. That's the law of karma. Buhari is a complete disaster and monumental failure - a despot and lunatic who thinks he can govern Nigeria with the same old decree during his military dictatorship in 1984. He's a complete disgrace and national embarrassment.